ManpowerGroup reported revenues for the fourth quarter of 2011 totaled $5.5 billion, an increase of 5% from the year earlier period. Revenues from U.S. operations totaled $765.9 million for the fourth quarter, 1.4% less than the $777.1 million reported for the same period in 2010. For the entire year of 2011, revenues from U.S. operations totaled $3.137 billion, a 12.7% increase from the $2.783 billion reported for 2010. Private-sector employment increased by 170,000 from December to January on a seasonally adjusted basis, according to the latest ADP National Employment Report released today. The estimated gain in employment from November to December was revised down to 292,000 from the initially reported 325,000. Employment in the private, service-providing sector increased 152,000 in January, after rising a revised 241,000 in December. Employment in the private, goods-producing sector rose 18,000 in January. Manufacturing employment increased 10,000, while construction employment advanced 2,000 during that period. Around 200,000 jobs were created in December, and the unemployment rate fell to a three-year low of 8.5%. However, a CNN Money survey of economists predicts that the government jobs report slated for release on Feb. 3 will show a decline in the number of jobs created to 135,000 and a slight rise in the unemployment rate to 8.6%. Experts attribute the increase in jobs in December to the hiring of temporary workers for the holidays, and say flat personal spending, lackluster financial results recorded by businesses in the fourth quarter, and ongoing weakness in the housing market will slow labor market recovery. However, Bobbi Moss, senior vice president of Scottsdale, AZ-based Govig & Associates, an affiliate of executive search organization MRINetwork, says there is growing demand for jobs in the manufacturing and health care industries and even the hard hit construction sector. She adds that her clients are giving out more signing bonuses and that she has seen more employers make counteroffers to people looking to leave, something that was almost unheard of a year ago. The Indiana Department of Labor and executives with Lucas Oil Stadium have begun independent investigations centering on MS Staffing and the firm’s practices. The staffing firm is providing hundreds of workers for the Super Bowl and provides year-round employees to Lucas Oil Stadium and a host of other companies in Indiana. The local television channel WTHR has received more than 60 complaints from MS Staffing employees who say their paychecks have been shorted week after week; employees are required to report to work in many cases hours before they begin work, but they are not compensated for that time. A former full-time staffer with MS Staffing says some employees refrain from complaining because they are in the U.S. illegally. Upon learning about the payroll problems, MS Staffing installed electronic time clocks at Lucas Oil Stadium and the Indiana Convention Center to help prevent payroll mistakes. Co-founder and president Leticia Snoddy attributes the payroll problems to the company’s rapid growth. Snoddy says the company follows “all state and federal laws,” but acknowledges that it is still in the process of putting new systems in place to ensure all workers are legally eligible to work. A longtime supporter of ASA, People 2.0 has elevated its commitment to the association by becoming a corporate partner. The financial support of ASA corporate partners enhances the value of membership by allowing the association to improve its products and services, and develop new initiatives that address emerging issues and trends in the fast-paced staffing and recruiting industry. 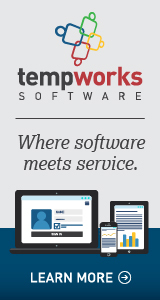 People 2.0 provides enterprise-level infrastructure and comprehensive support services to staffing companies. 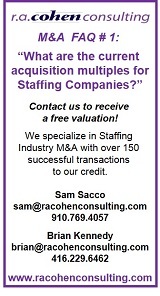 For more information, visit americanstaffing.net. Tomorrow, Feb. 2, 3–4 p.m. Eastern time, attend the ASAPro Webinar “Recruit Career Activists—The Top Talent Hidden in Every Generation,” presented by human resource consultant Peter Weddle. Get a preview of his book The Career Activist Republic and learn how to identify top talent in all generations. Networking is one of your most essential tasks as a staffing professional. ASA can help you connect with industry peers on LinkedIn, Facebook, and Twitter. Join the ASA LinkedIn group to participate in online discussions, post job openings, and respond to poll questions. You also can join one or more sector-specific subgroups—for health care; industrial; professional; search and placement; and technical, IT, and scientific staffing. “Like” the ASA fan page on Facebook to engage in conversations, share pictures and videos, and post news stories about your company or the staffing industry in general. Stay informed about what ASA is doing in your area and around the country by following ASA on Twitter. The U.S. Department of Labor has for the past two years been considering revisions to the record-keeping regulations under the Fair Labor Standards Act that would require a company that classifies an employee as exempt to prepare a written justification of the basis for the exemption. This document would have to be provided to the employee and would be subject to inspection by DOL. DOL’s plans for new regulations are published semiannually in the Unified Regulatory Agenda. In the most recent edition of the Unified Regulatory Agenda, published on Jan. 20, DOL moved the “Right to Know” rules from the “Proposed Rules Stage” to “Long-Term Actions,” and removed any projected date for issuing proposed rules. “Long-term actions” are defined in the agenda as “items under development but for which the agency does not expect to have a regulatory action within the 12 months after publication of this edition of the Unified Agenda.” That being the case, it appears that DOL does not plan to move forward with the rules until Jan. 20, 2013, at the earliest. The author, a partner of Seyfarth Shaw LLP, notes the key to successful compliance strategies for businesses and their legal counsel is to keep a focus on what is “coming down the road” in the future. He says investigators and attorneys from the U.S. Equal Employment Opportunity Commission have their “radar on” for issues involving employers’ use of criminal background checks and credit checks in the hiring process, citing the recent settlement with Pepsi for approximately $3.13 million as an example of that focus. U.S. companies are looking to hire and retain those who are skilled in areas such as mobility, cloud computing, software development, and big data, according to two recently released reports. One comes from information technology staffing company Bluewolf, titled “2012 IT Salary Guide,” which provides an in-depth look at IT salaries and hiring trends. Bluewolf identified several skills that are in great demand, such as proficiency with Eloqua, Marketo, Salesforce, and Google Apps. In the mobile arena, demand for developers who know HTML5, iPhone/iPad, and Android is also on the rise. The other report is Hackett Group’s “2012 IT Key Issues: Coming to Terms with the ‘New Normal’,” which identifies top companies’ key priorities for the year. According to Hackett Group’s survey, company leaders have indicated that one of their top goals is expanding the reach of their IT service delivery models, thus increasing the need for skilled IT professionals. As law firms cut back on entry-level hires, they have increased their efforts to acquire partners from other practices. Partner defections increased in 2011, and legal industry observers predict the trend will continue in 2012 as firms compete for business amid sluggish demand for legal services. Lateral hires remained by far the most popular option for growth last year, according to an Altman Weil survey of 240 law firms. More than 91% of partners who responded said they planned to pursue more lateral hires. A report to be published today by American Lawyer finds that 2,460 partners exited or joined top law firms in the first nine months of 2011. Most Americans will be cautious with their money in 2012 and focus on their personal short-term financial recovery rather than long term investments, according to the recent Workonomix survey by the finance and accounting staffing firm Accounting Principals. Only 27% of workers plan to put money away in an emergency savings fund and only 23% plan to contribute more to their company’s 401(k) plan. “Following the recession, it’s not surprising to see that many American workers are allocating their income toward paying down their debt. With the economy continuing its slow recovery, it’s clear that consumers are focused on gaining financial stability in the short term before turning their attention to investments with longer term benefits,” says Jodi Chavez, senior vice president at Accounting Principals. According to a study by Robert Half International, employers are increasingly willing to negotiate on salary. The staffing firm found that 38% of 1,600 chief financial officers surveyed are more willing to negotiate salary with leading candidates than they were 12 months ago. Only 5% said they are less willing to negotiate. A recent Adecco Insights Survey indicates that 60% of those polled by phone expect job availability to increase this year, and 24% plan to request a raise, bonus, or promotion. Of the 20% who planned to ask for a raise, bonus, or promotion in 2011, just 13% followed through. The survey reveals that 41% of respondents expect to receive a raise, bonus, or promotion this year. Additionally, 52% of men and just 37% of women plan to ask for a raise, bonus, or promotion.